Don’t just report traffic, report solutions. Partner with the world’s most trusted driving app and give your audience the traffic news they’ll use. It’s 100% free. Show viewers traffic trouble spots and how to avoid them. Interact with your viewers live on air - right from your iPad. No helicopter required. Everything that’s happening on the road, all in one place. See major traffic jams, road closures and everything in between. Customize and make it your own. 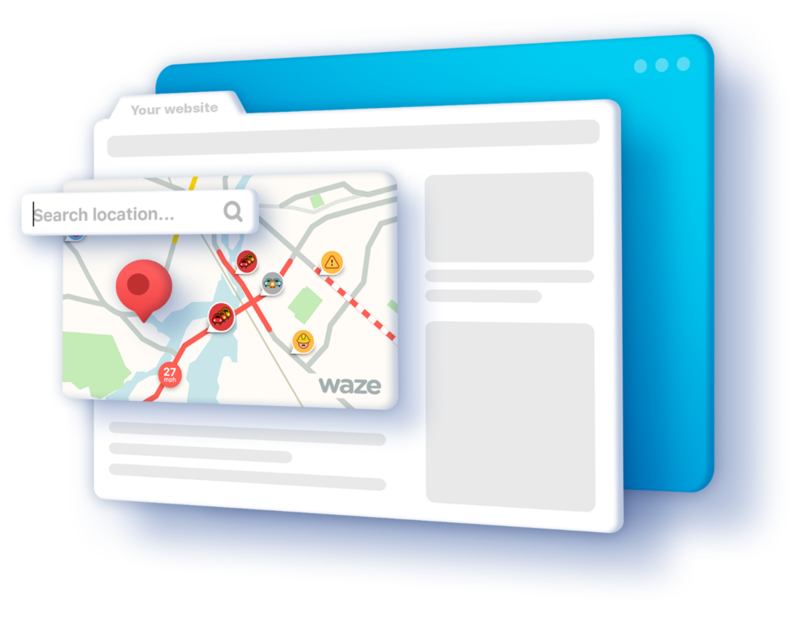 Seamlessly integrate the Waze Live Traffic map on your website so your visitors can see current traffic conditions. WIth the W on Air iPad app, you can broadcast live traffic conditions to your viewers. Easily interact with the map as you report on traffic hotspots and provide alternate routes. Continuously updated and available 24/7, Waze’s Traffic View is your resource for everything happening on the roads. Easily view info about traffic jams, crashes, construction and more. Let visitors to your website search for locations, view real-time traffic updates and get turn-by-turn directions with the Waze Live Map. What is Waze for Broadcasters? Providing accurate, real-time traffic news is a difficult job. To make it easier for TV broadcasters, Waze built a program that provides a variety of powerful tools and content to conveniently research, create, and display accurate and relevant traffic news. Why is Waze for Broadcasters 100% free? Waze is a community-driven app. Partnering with broadcasters is an important step to grow a global community of users and better the experience for drivers around the world. We provide easy-to-use tools with powerful real-time traffic insights and ask that partners help us spread the word through attribution. Signing up is easy. Complete the Partner Interest Form, accept our online agreement and a member of our team will reach out and get you on your way. What is W on Air? Traffic broadcasters use the W on Air iPad app to present the most informed, real-time traffic news to their television audience. This 100% free broadcasting app lets you interact with the Waze Live Map, rich with traffic data including jams, road closures, estimated drive times, and the fastest alternate routes to bypass traffic. As you use the map, the display is projected on a big screen for easy reporting. With over 50 million drivers, the Waze community is first to report traffic conditions and update the map with meaningful information. It’s like a team of traffic reporters linked directly to your newsroom in real time! What is Waze Traffic View? Traffic View is a dynamic, real-time monitoring dashboard showing a complete overview of traffic in your area, 24/7. 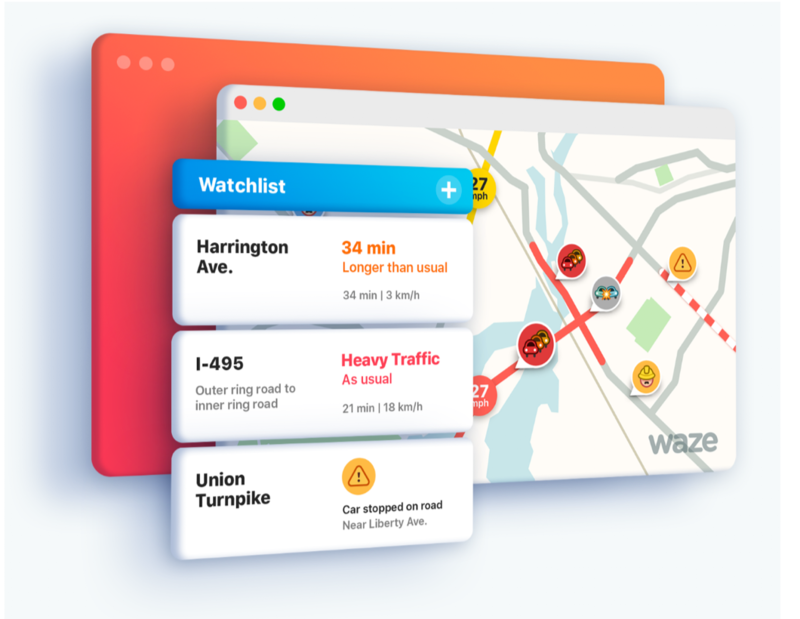 This tool does the heavy lifting for you, comparing historical traffic data with live road reports shared by millions of Waze drivers, to give you the most accurate view of what’s really happening on the road RIGHT NOW. In addition to W on Air and Waze Traffic View, our partners can also add an embedded Waze branded Live Map to their website. Waze Teams, available exclusively to our broadcast partners, creates a station-branded Waze Team to get reports, photos, and updates direct from the road to your traffic desk. Encourage viewers to join your Waze Team from inside the Waze app and grow your own interactive and engaged traffic community. 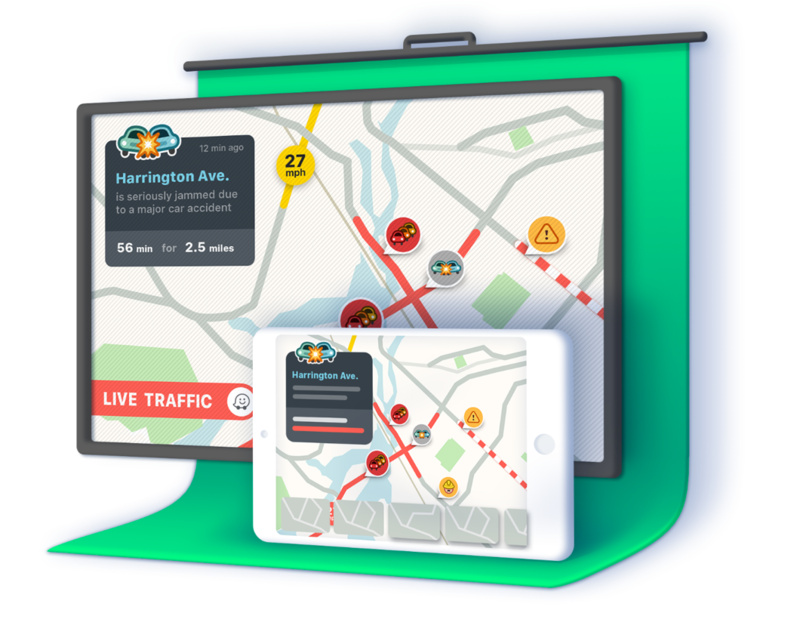 Waze for Broadcasters also provides partners with comprehensive coverage of Major Traffic Events and other packaged content around local traffic trends to provide you with a complete overview what’s happening on the road. Why should I use Waze for my traffic reporting? Be the first to know and the first to report. Waze is built to handle very large volumes of data in real-time and provide drivers with the fastest route from point A to point B. The Waze for Broadcaster program allows media outlets to leverage these smart algorithms, view reports from millions of local Wazers on the road, and turn it all into actionable and reliable traffic content. How much time does it take to set up the tools? Setting up the tools is easy, most new partners are up and running within a week. Can we test the program? Absolutely. Our agreements are structured very openly and meant to provide a use license for partners. Speak to a Waze contact to set up a test run. Do I need certain hardware to use Waze Traffic View or W on Air? Waze Traffic View is a web-based dashboard and only requires a computer with access to the internet. To use W on Air, an iPad and a casting device - like Apple TV - is needed. We also recommend a dedicated internet line to ensure fast load times. Is there a white label version available? No, W on Air does not offer a white label product as our service is 100% free. In return, we ask broadcasters to credit Waze during broadcast to help grow the community. Is it possible to have an exclusive partnership with Waze in our region? No, Waze does not offer any exclusive partnerships. Waze is an open platform and we believe it’s our obligation to give back and serve the community equally. Whether you’re broadcasting on TV or radio, Waze has the tools to give your audience the most accurate traffic news.